IDEx helps keep your fire and EMS membership informed of current dispatches as well as non-emergency messages while in quarters. When combined with our Alarm Data Interface application, IDEx will both display and announce dispatch information. Your dispatch and custom non-emergency messages can be displayed on any number of in-house VGA monitors as well as on BetaBrite and selected Adaptive® indoor LED sign boards which can be strategically located througout your station in order to insure that all members are kept updated. You can think of our IDEx system as a virtual bulletin board. Our Dispatch Audio function allows you to hear the audio output of your IDEx computer when connected to your station's public address system so that when a dispatch is received the data message from your dispatch center is properly parsed and spoken via IDEx's built-in text-to-speech engine. You have full control over the voice types used (male, female, etc.) as well as how pre-designated words, unit IDs, etc. are translated and pronounced. Additionally, the dispatch information can be audibly repeated through the speakers at predesignated timed intervals so that later arriving responders can hear the dispatch information as well. Additionally, IDEx enables you to pre-assign a unique WAV file to each incident type that you may be dispatched to. The IDEx system consists of the IDEx Controller, IDEx Display and IDEx Web Portal. The IDEx Controller is installed on one workstation or server in your station and is used to setup the global options for IDEx. All LED sign boards are fed by the Controller. IDEx Display is used to display all dispatch, recent incidents and custom messages on VGA monitors as well as facilitating all text-to-speech functionality. Recent incidents are color coded so that you always know the status of your agency. This application can be installed on any number of networked workstations. The IDEx Web Portal allows authorized users to maintain custom messages via our secure, Internet based website. Agency's with multiple stations can create customized profiles that allow specific user logins to maintain messages at all of their stations. 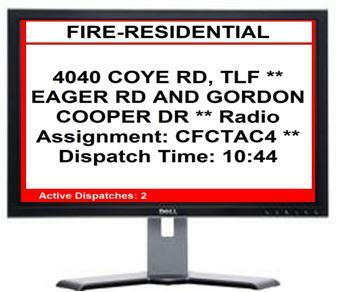 This means that one message can be created and any number of stations can be selected to display that message. Furthermore, all messages are assigned to a custom schedule. Each schedule and associated message(s) can be configured to disappear once expired. This insures that there are no outdated messages that need to be manually removed by a user. IDEx Controller requires its host to have a minimum of 1 GB of RAM and a processor speed of at least 1.0 GHz. A DSL or Broadband Cable connection to the Internet is required.